In baking, the most common form of milk is non-fat dry milk (NFDM), which is dehydrated skim milk. Liquid milk is a white fluid secreted from the mammary glands of a female bovine. In baking, the most common form of milk is non-fat dry milk (NFDM), which is dehydrated skim milk. Dry milk is much more stable longer than liquid milk and is also easier to bulk transport. It provides several functionality benefits to baked goods. What if I do not have fresh whole milk? In baking formulations, fresh whole milk can be replaced with NFDM, butter and water. For every 100g of whole milk, use 8.5g NFDM, 3.5g butter and 88g water. Its combination of proteins and lactose (fast-browning milk sugar) produce desirable Maillard reaction browning. This combination, along with milk fat, also delays staling of baked products, especially that of lean bread doughs. When using milk instead of water, the crust is softer in products like cream puffs and pan bread. It is also considered a dough strengthener because of the way it reacts with flour in strengthening gluten formation. Milk became commonly used upon the domestication of livestock, mainly dairy cows, around 9000-7000 B.C. 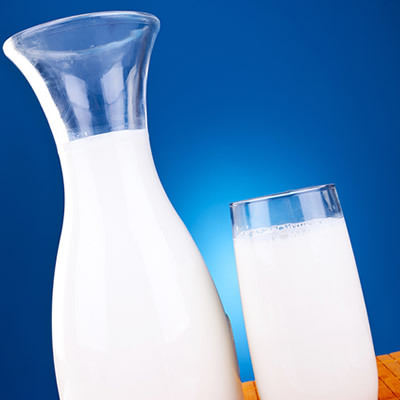 Today, liquid milk is pasteurized, killing any harmful bacteria before being packaged for market. Liquid milk: In the Western world, it mainly comes from dairy cattle and is consumed after pasteurization and homogenization. It comes in all varieties of fat content, ranging from whole milk (3.5% fat) to skim milk (1-2% fat) to nonfat (0-0.5% fat). Non-fat dry milk (NFDM): This is ideal for bakers as it has a longer shelf life. And because it is in powder form, it is much easier for bulk transport while still providing the nutritional value of liquid milk. Evaporated milk: It’s a concentrated sterilized milk product with a concentration twice that of standard milk (60% of its water has been removed). Shelf life can be up to a year once canned and processed properly. Condensed milk: This is also concentrated but not sterilized. About 50% of water has been removed from the whole milk, and the final product contains about 44% sugar. It is kept preserved from this high concentration of sugar added to the milk.